Aimed at the beginner to Deep Sky astro-photography, new concepts are explained in plain terms ensuring the reader develops an understanding of the equipment and its use. Advice is based on tried and tested methods aimed at producing acceptable results early on by drawing on my own experiences as a beginner and those whom I have assisted in the past. The logical progression of an imaging session and subsequent post processing of the images is explored in depth in an easy to read and understandable style with numerous illustrations and examples to lead the beginner through to more advanced topics. 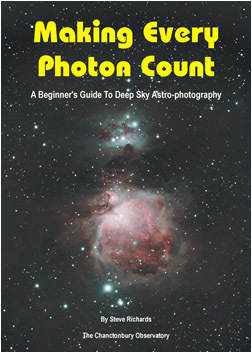 First published in 2009, revised and updated in 2011 and again in 2014, this book will fill a gap in the list of publications aimed at the astro-photographer. Many excellent books on the subject of astro-photography are essentially showcases for the authors work using the latest state of the art equipment acquired over many years using methods honed through long experience of imaging. Although without doubt these books give the reader something to aspire to and the images are, of course, a very important and worthwhile part of any book, the 'high end' nature of the equipment in use is often far removed from the realistic purchases of the beginner. This book seeks to redress this by discussing the use of equipment more in keeping with the beginners budget. The book goes to some lengths to discuss the minimum requirements as well as the more desirable equipment that would be on many a beginners wish list with an emphasis on the importance of the mount over everything else. The importance of other beginners experiences have been a mainstay of the topics discussed as the same old questions come up again and again on the bulletin boards and forums where I am an active member. I have learnt much from and subsequently contributed to the numerous astro-photography based topics on these forums and the answers to these same old questions are pretty much always the same - and those answers are to be found in my book. To help with the dark art of post processing, access to special pages on my website is given where sample files can be downloaded to try out the procedures discussed in the text using both commercial and free software. On these 'reader resource' pages you will also find additional articles to supplement the contents of the book. A links section on my website is also available to readers where a single click will take them to the websites mentioned in the book. �.95 plus p&p (�95 UK - �65. EU - �50 Rest of World). For multiple orders, please contact us.